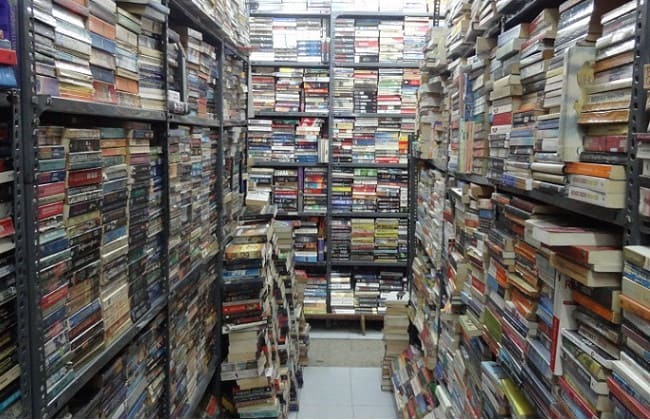 Mayi Gowda, the owner of Blossom Book House, was a former engineer who started to sell books in 2001. Initially, he sold books on the pavement outside his hostel. Soon, he owned three floors of books and today there are two Blossom shops on Church Street. Blossom is a bookshop where you will find any book that you are looking for and at times even discover ones that to the very moment you didn’t know existed. If you aim to read even 5% of the books in this bookstore you are sure to suffer from vertigo of excessive knowledge. Gowda is the son of a farmer who grew up in a small village called Rangsamudra that is around 22 Kms from Mysore. He secured his diploma from Mysore and stood 7th in his class. Mayi Gowda was very keen on studying engineering. Post acquiring Diploma his father stated that he wouldn’t be able to support him financially for the engineering course. However, Gowda was determined to study electrical and electronics engineering and so he shifted to Bengaluru in 1995. He pursued the course from the University Visvesvaraya College of Engineering. Mayi studied during the day and worked 12 hours in the night to make ends meet. He had no option but to pay for his education. During the second semester Mayi started to sell books along with the other booksellers outside his hostel near Majestic. Post three months, he dropped out of the college and shifted to MG Road in order to make more money through the book business. Since the business was going well, he called one of the boys from the village to help him. Soon he managed to raise enough money to pay for his education and completed the engineering course. He was even offered a job by GE however he barely worked there for a couple of weeks. Mayi wanted to continue selling books and he did. However, he had very little knowledge of the business world. It was in 2002 that he first opened a 200-sqft shop on Church Street with a collection of second-hand books. Soon it grew to 3500-sqft. They recently opened another store on Church Street, which is 8,650-sqft. Blossom’s business model reflects simplicity however Mayi Gowda has ensured it’s an effectual one. He believes in ‘consumer satisfaction’ and the business model dynamics echoes this belief. Mayi Gowda has talked about how a lot of people who love reading buy books on a frequent basis but there comes a time when they run out of storage space. At Blossoms, they make it easier for the bookworms. He allows them to sell the books to Blossom for half a price. He even allows his customers to hang around the store and read as long as they like. According to him, one can only buy so many books and just because you cannot afford to buy another doesn’t mean you can’t read another. This consumer-obsessed approach is also reflected in the way Gowda connects with his consumers. He makes an effort to interact with most of his customers. Usually, people don’t know the bookstore owners. However, at Blossom, you will definitely find Mayi ready to change your life through books. For him it’s all about customer satisfaction. An approach Amazon lives by. Blossom has been facing competition from every end – the other bookstores at Church Street, the online book businesses, and the technological inventions such as Kindle. Recently, even Amazon entered the category of used books. However, despite the competition, Mayi Gowda, isn’t worried about downscaling. Blossom isn’t just selling books; it is cultivating a habit of reading. According to an article on Citizen Matters, Gowda talks about how he, as a kid, would read several books in Kannada. Gowda’s favourite book is Animal Farm by George Orwell because it’s a satire about communism. A book he read when we was 18 years and it left him inspired. He discusses how the habit of reading is being developed in children in Bangalore. Parents often bring their kids to the store and incite them to read. In another article he talks about how kids today value the joy that books bring. Blossom is indeed a magical place with books unspooling out from every nook and corner of the store. Yes, the constantly evolving internet and technology world is changing everything around us. However, there is no greater feeling than being surrounded by sea of books speaking to you and waiting to transport you to a parallel universe – far away from reality. Whether you are a book lover or not, you need to visit Blossom to experience how a Bibliophile feels. If you are already a Blossom lover then here’s an awesome weekend tip for you – go to the new Blossom store on Church Street and find the most rarest book that can help you step into a space where no one else can enter. Unwinding with an incredible book is the perfect way to end the week. Have a great weekend!